Drink Up – In Our Special Cups! Order $30 of your favorite coffee and get our Enjoy Better Coffee insulated glass for FREE! Please write “Double Wall Cup” in the order notes at checkout and it will be shipped with your purchase at no extra charge. NOTE: Order must equal $30 minimum after any applied discount; shipping not included. Order must be placed by 11:59 p.m. EDT Thursday, August 27th, 2015 on EnjoyBetterCoffee.com with specified order notes to receive free logo glass. Offer available while supplies last. No substitutions. Not redeemable for cash. It was 125 years ago this year that Dutch painter Vincent van Gogh died in France. In Holland (and Belgium and France), the artist’s life is being honored with many high-profile exhibitions and festivities. Here are 10 things you should know about this iconic Dutch painter. 1. The painter was born in Groot-Zundert, Netherlands in March 1853. He died in July 1890 at age 37. 2. He was 27 years old when he painted his first piece. 3. When he began painting, he used local peasants as models. He would later paint flowers, landscapes and even himself, in large part because he was too poor to pay proper models. 4. The artist suffered from a type of epilepsy that caused recurrent seizures. 5. It was during a seizure that he tried to attack a friend – Paul Gauguin – with a razor but instead cut off a piece (just a piece) of his own ear. 6. “The Starry Night” was one of his most famous works. He painted it while in an asylum in France. 7. 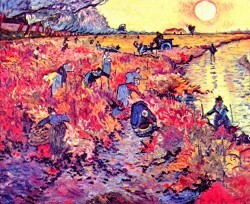 In the short ten years he painted, van Gogh created about 900 paintings. 9. The artist visually depicted turbulence, a complex mathematical principle, in several paintings completed during particularly chaotic times in his life. 10. And finally, and this is probably most surprising, Vincent sold only one painting in his lifetime and only became famous after his death. Because this is a commemorative year celebrating the painter’s life, there are many travel tours offered for visitors including cycling through the cities and areas where he was born, where he lived and other important places in his life. No visit to Holland to learn about van Gogh would be complete without a visit to the van Gogh museum in Amsterdam of course. Even if Amsterdam is on your travel plans this year, you can enjoy a Ted talk on our Facebook page about his “Starry Night” painting and the secrets behind it while you sip some delicious Douwe Egberts coffee. We will give you 10% off all Douwe Egberts coffee and Senseo pods on www.EnjoyBetterCoffee.com with no minimum order. * Order today! *Discount valid through 8/25/2015 on www.EnjoyBetterCoffee.com with no minimum order. This discount cannot be used with any other coupons or discounts. Not valid for discounted, special sale or case sale Douwe Egberts or Senseo items. Purchase our 2 pack of Douwe Egberts Aroma Rood Donker and receive an additional package on us! Your free package of Aroma Rood Donker will be automatically added at checkout. No coupon code needed. Order must be placed by 11:59 p.m. EDT Thursday, August 20th, 2015 on EnjoyBetterCoffee.com to qualify. Offer available on the two pack of Douwe Egberts Aroma Rood Donker only. No substitutions. Get a 4.2 oz bag of Kopiko Coffee Candy with your order! Write “Coffee Candy” in the order notes at checkout and we will include a bag of Kopiko Coffee Candy with your order at no extra charge. NOTE: Order must be placed by 11:59 p.m. EDT Thursday, August 13th, 2015 on EnjoyBetterCoffee.com and include specified order notes to qualify. No substitutions. Not redeemable for cash. Ms. Austen wrote this in a letter to her sister, though with the hot weather across the country, it could have been written by many of us! Struggling in the heat? Here are some suggestions for cooling down. 1. Lie on the floor. Hot air rises, so get down where it is cool. 2. Eat spicy food. It will heat up your mouth, but make you sweat, which is the body’s way to cool. 3. Place a bowl of ice in front of a running electric fan. A swirl of cool air will result. 4. Place your pillow in the fridge all day, then rest your head on the cool. Your temples are pulse points, so the veins are closer to the skin’s surface. Cooling those will help lower your temperature. 5. Breathe into a cup of ice. Your breath will force out the cold air and stimulate a breeze on your face. 6. Drink an iced coffee. *Discount valid through 8/11/2015 on www.EnjoyBetterCoffee.com with no minimum order. Not valid with any other coupons or discounts. Not valid for discounted, special sale or case sale items. Purchase our 2 pack of Kimbo Aroma Intenso and receive an additional package for FREE! Free package of Kimbo Aroma Intenso will be automatically added at checkout. No coupon code needed. NOTE: Order must be placed by 11:59 p.m. EDT Thursday, August 6th, 2015 on EnjoyBetterCoffee.com to qualify.